We may be sour, but we know our sweets. Home » 5 Freshest » Salute The Flag, Kids. Haribo Flags, Of Course! Salute The Flag, Kids. Haribo Flags, Of Course! Any time you see a candy like this, you can pretty much bank on the taste : super powerful sour power mixed with the typical sour flavors : apple, cherry, or the non-existent yet always-there blue raspberry. 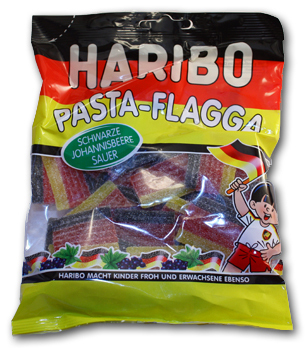 Haribo’s other offering like this is called fruity pasta. I love them dearly, and don’t even mind the layers of skin that fall off my tongue after eating a bag. I miss them, but I don’t mind them. Cute, eh? German flags. Yay Germany! As I broke this bag open (I had been lusting after these for a while, and yes, my patron saint Susie sent them), I was expecting that same bombastic surge that fruity pasta delivers. Nope. In fact, I was eating them along with some other more sour candies, and I couldn’t even really taste these at all. So I did what anyone would do : I ate a pizza. Then, after that, I cleansed my palette, waited a while, and then dove back into the bag. This time, the flavor wasn’t hiding. These aren’t extremely sour-more like very tangy. And the flavor? Johanissebeere. Duh. For those 5 of you that don’t speak German, that’s black currant, one of my favorite candy flavors. These aren’t the typical “sour candy for kids” – popping flavors, extreme sour, etc. They’re much more subtle, with more depth. The black currant flavor grows, with the tangy/sour edge giving it extra zing. Unlike all the wine gums with black currant flavors, these are kinda unique, due to the sour bonus. Lesson learned : these aren’t good to mix with other candy-too subtle. It’s like mixing scallops with Flamin’ Hot Cheetos – you’re just not gonna be able to taste the scallops. Don’t get me wrong, Flamin’ Hots are bomb.com, but they shouldn’t be mixed with scallops. On their own though, these Flaggas are excellent. Sweet, sour, deep, hints of different kinds of grapes and berries….delicious. Here’s the kicker – you CAN get them here in the states! They’re not cut into squares, but instead are in strips. Check ’em out here, I think you’ll like them. A lot. I like this review. You are witty and charming. I like these things too. Don’t loooooooooooove them. Mind you – I got a huge box of them and ate them en masse at my desk and perhaps I just overloaded too much. I mean, it is Haribo so by default I go 7 stars to Start. Just don’t eat too much at one time. Laurie P. on Haribo Sour Streamers….NEW! 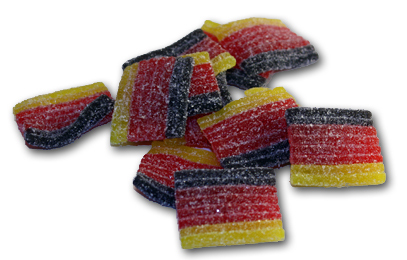 Matty on Haribo Sour Streamers….NEW! Subscribe to The Candy Gurus! Get all of our reviews in your inbox, lazy style. Who are the Candy Gurus?